I know I've been m.i.a. around here this past week. We've had a pretty big life change happen in our family which has kept me super busy since last Thursday, so I apologize for my lack of posts, unanswered social media dm's, and sporadic blogger visits. After Tuesday though, we should be back to normal. I was hoping to share today's recipe with you all closer to Easter or Mother's Day, but without any time to work on this week's Golden Blossom Honey recipe, I had to reach into my archives of photos I have stored in my vault of other recipes we've already tried from them in the past. 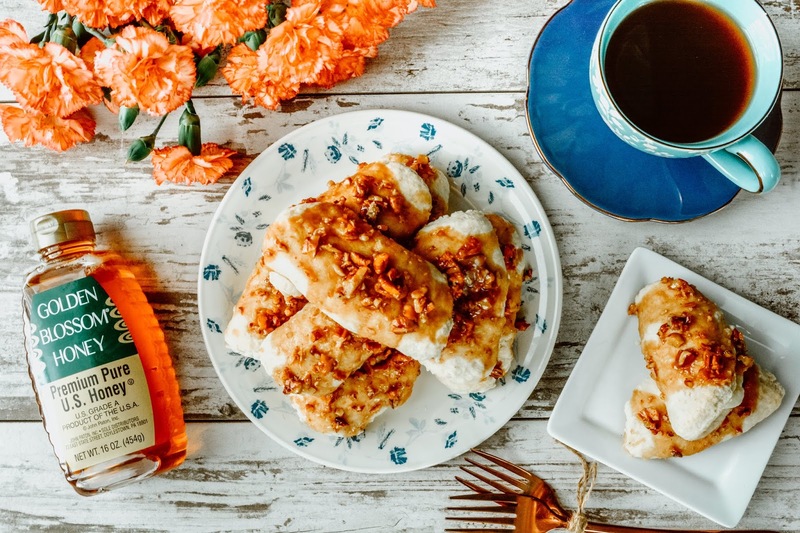 Even though this would be fabulous served for Easter or Mother's Day breakfast or brunch, Pecan Cream Cheese Breakfast Pastries are just as lovely for a weekend breakfast too! Since I'm a sucker for all things cream cheese, these breakfast pastries are already a star in my book, but add on the honey-pecan syrup, that pushes them to the tip top status as far as breakfasts are concerned around here. Since we're officially in spring now, I'm sure we have a fair amount of rainy day weekends ahead of us. Cure those dreary day blues by whipping up a batch of these sweet pastries for a quick pick-me-up. If you do make this recipe or any of the other Golden Blossom Honey recipes I've featured here (find them in my recipe tab at the top of this blog), be sure to share it on Instagram at tag your pics with #goldenblossomhoney. I'd love to see what you're making! Easter, Mother's Day, or weekend breakfast, what do you think is the best day to serve these pastries? What big life change, deary? What happened? Lovely looking pastries indeed, and lovely set of colours as always! Thanks, dahlink :) We have brought in a family member to live with us. Since it’s not fully permanent yet, and I foresee a small battle ahead with her parents, I probably won’t talk about her much on the blog until we can ensure we have every legal claim to her. I figured out as much myself! Drop me a line at Facebook if you feel like talking! I think I've developed a sort of an inner sense for things not going right over at your place as I've felt it throughout this week and before as well, whenever something was happening over there! Sending you positive energy! To the kid as well. That is making me so hungry. It's like dessert for breakfast. I have to make these. I hope you do Stacie! I agree. It's good any time! You won't mess it up. It's soooo easy! These pastries look so so inviting. Normally I avoid anything sweet during breakfast.But this one I probably can't resist if I get it in front of me. I try to avoid sweets for breakfast too, but sometimes a pastry or doughnut just can't be passed up. Easter is coming up. This does look good. For Easter I always make a coffee cake. I didn't mean to make it a tradition, but made it a few years in a row, so Mica named it a tradition. I'll have to make this around Easter. Now I want to know what life changes you are talking about are. I'm such a nosy person. Coffee Cake is a great Easter tradition! I could eat it for any holiday, really. You're always welcome to Facebook me and be nosy lol. We just gained custody of my 12 year old niece, so it's been a big transition getting her adjusted here, enrolled in school and such. She took Mariah's room, so I'll be painting that next week over spring break. I'm just too zapped to do it right now. Sound like they work for any time of day or occasion. Hopefully the life change gets worked out. Yes, you could eat these as a treat whenever :) Thanks for the well wishes on the changes! WOW I can not wait to try this recipe!! Thank you so much! I hope you enjoy, Holly! I hope the life change is good. The pastries do look good for ANY day. I say treat yourself whenever you get the chance, and this is surely one way to do it. Yum. Ohhh this sounds really good. I'll have to print it out and make it. I agree with all your commenters, Theresa! These look scrumptious. I'll likely try them after my next short trip. All the best to you with your life change. I've found blogging friends so respectful and understanding when things get crazy. Take care! Thank you so much! I so agree about wonderful the blogging community is when things get crazy. So loving and supportive, through and through! I'm all in for these breakfast pastries! I love cream cheese anything. This is a winner. Me too! Cream cheese is always a good idea! Oh goodness, these look so good. I have no doubt the family would be very happy with me if I made these for breakfast. I hope for a positive outcome in whatever life changes you are going through. Anyway, thank you for the recipe. I wish someone in my family would make a delicious breakfast like this for me, for a change. Thank you Annemarie :) I also wish for someone to treat me sometimes too, but it seems I'm always the one pulling up my sleeves and putting the work in. These sweet pastries would surely cure any rainy day blues! Looks delicious! I love cream cheese, as well! I usually eat a bagel with cream cheese for breakfast, but this looks way more appetizing! Cream cheese is one of my favorite things to add to pastries and breads. Such a great addition to breakfast and dessert recipes. I am a huge fan of pastries and these look so yummy. Thanks for sharing the recipe. OH MY Goodness! This one definitely caught my attention as I am looking for a great Easter Breakfast idea. THANK YOU for sharing! You're welcome Bobbie :) I hope you like them as much as we did! Pecan Cream Cheese Breakfast Pastries looks so good! I can’t wait to try this recipe. My family would be happy for sure! I've used Golden Blossom before and I love it! Still have some on my shelf, actually. 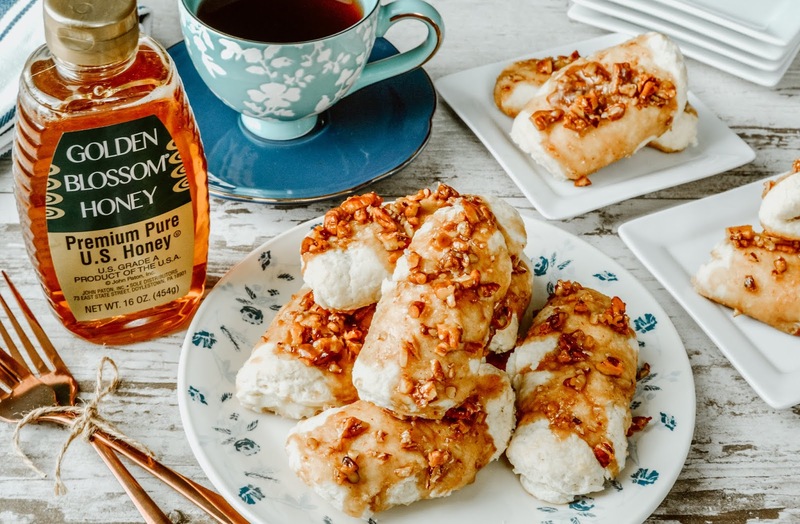 And these pastries with the honey pecan syrup just sounds amazing! Golden Blossom Honey is such an amazing brand! Just makes everything that much tastier :) I hope you use some of yours in this pastry recipe. If not, be sure to check out their recipe selection for hundreds of tempting recipes to try!